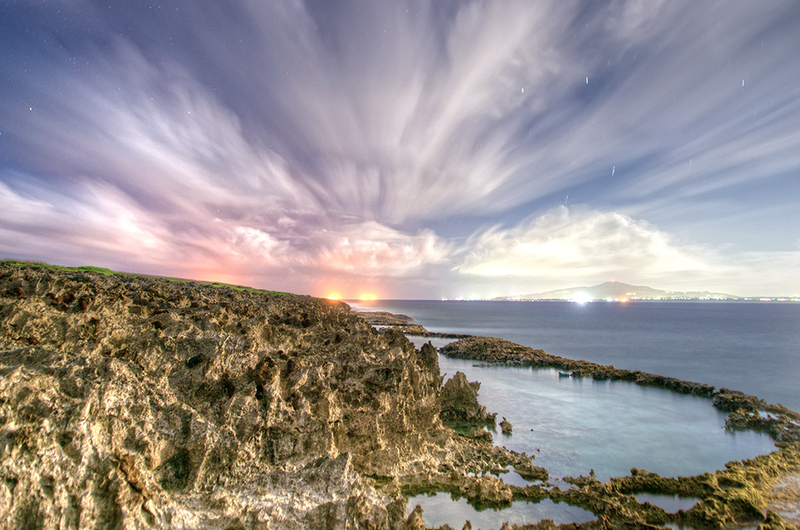 Tinian Blow Hole (at night), Tinian. This picture was a long exposure as you can tell by the movement of the clouds and the stars in the horizon. You can see the island of Saipan in the distance, with all the lights and what not taking view. Ancient coral outcrop line the edge of Tinian bordering the dynamic yet majestic ocean to create a contrast of textures. Suicide Cliff, Tinian. When the Americans were on the verge of winning the Battle of Saipan, or the Battle of the Northern Mariana Islands, the Japanese forces chose to take their lives instead of surrender to the Americans. This specific cliff was where the Japanese would jump into the big blue ocean in the attempt to take their lives. This photo was taken at night, as you can see the stars in the horizon.